Larry's Comment: Another nice view Prem. She's a beauty. Great job! I have owned 2 Jeeps before. Rubicon and Sahara. But those were both new ones and I wanted to get an old one and fix it up. That's the time I found '94 Wrangler with worse condition. But all these years, I put the money and effort and now- it is the condition you see!- No Pain No Gain! I had to tell you that when I started this project, my wife thought I was crazy. Now... it's a beauty.. I am so proud of my work. I have two roll bars. One is for the 91 CJ [it fits mine] and another one original Wrangler roll bar. I really love your site. Thanks for the opportunity to show off my Baby! Your jeep is gorgeous! I have a 2005 TJ sport. That I've been thinking about customizing. I think I am now convinced. Nice one! I too recently purchased one and have started down the same path. Nice to see it can be done and done classic. Wonderful example. You should be very proud!! I am doing same or trying... Very nice man. 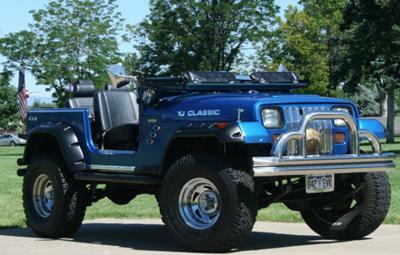 I have spent the last three weeks on the net looking reading and dreaming about Jeeps. I bought a 94 YJ 2 days ago. It is in fair shape and all stock, but it is also very plain. When I ran across your Jeep I really liked what you have done with it and just hope I can get mine close to where yours is, and I would really like to talk with you directly to get some suggestions. Again, you have a Gorgeous Ride! ESTA BIEN. WE ARE FROM EL PASO, TEXAS. OUR CLUB NAME IS LOS COMPAS. Mine is white, with tan seats, carpet and has a soft top. I use it as a tow car behind a motorhome. It is like new! Never been off road. Yours is super!!! This is Great...can not imagine luxury Jeep. I also have a '94 Jeep YJ (original owner). There is just something about the YJ's I've always liked!!! Can you tell me the full specs on that, such as color, tires size, lift, etc.